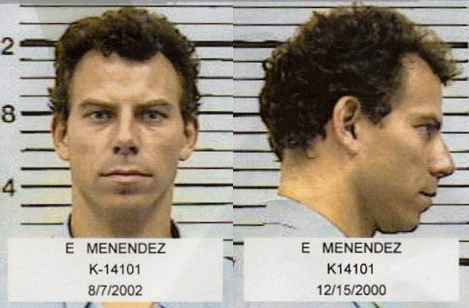 BEVERLY HILLS, Calif. -- Twenty-five years ago, on the night of Aug. 20, 1989, Erik and Lyle Menendez gunned down their parents in the den of their Beverly Hills, Calif. mansion. Erik was 18, Lyle 21. Their father,entertainment executive Jose Menendez, was shot in the head from point-blank range. Their mother, Kitty, was shot multiple times while trying to escape. The brothers' first trial, which was broadcast on Court TV in 1993, became a national sensation. At that trial, they admitted to killing their parents, but their defense attorneys surprised the prosecution with an abuse defense, according to the Los Angeles Times. The brothers were tried together, but with separate juries both deadlocked between murder and manslaughter convictions. In the retrial, cameras were not permitted in the courtroom, and the horrific details of the murders became the focus, the Los Angeles Times reported. Prosecutors highlighted Jose's bloody shirt, the broken bones in Kitty's face, and an image of her mangled right hand. The second time around, the jury rejected the brothers' abuse defense, convicting them of two counts each of first-degree murder and conspiracy to commit murder. In 1996, both brothers were sentenced to life in prison without parole. Erik and Lyle Menendez are housed in separate prisons in California, and both have since married -- Lyle twice.